Washington Township in Hendricks County Indiana was forged and molded by great people. The Washington Township Government, Avon-Washington Township Public Library and the Washington Township Parks have come together to make a program that will, not only celebrate some of these great people, help keep the history and memories alive of our Forefathers (and Mothers). Register here. Registration is now open. If you have any questions, please email ttayman@avonfd.org or call (317) 745-0785 ext. 3. 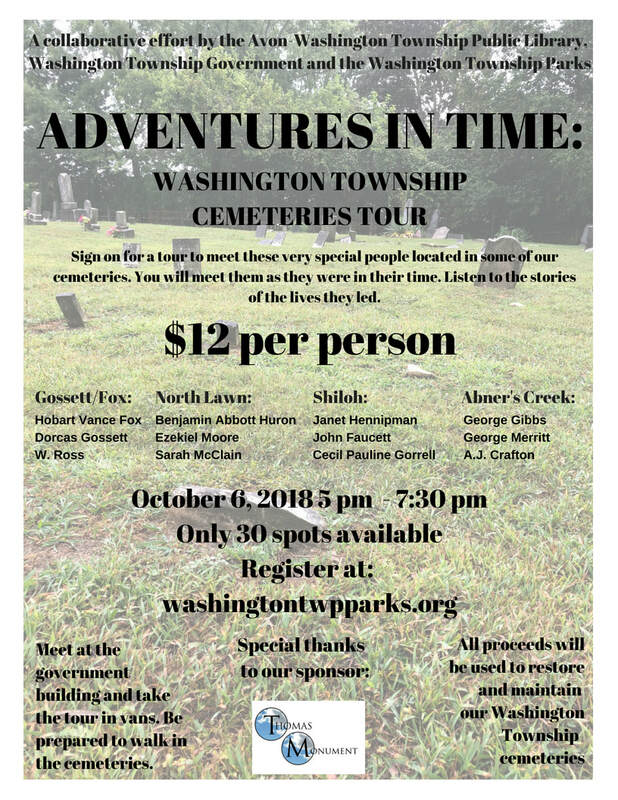 The tour will begin with an overview of the program and the Washington Township Cemeteries. We will divide into two groups to tour the highlighted cemeteries for this program. At each cemetery, a point contact will give you an overview for you time at the cemetery. You will enjoy a narration of selected notable members. The program allows for just enough time for our portrayals. Thanks to our sponsor, Thomas Monuments, all of your paid proceeds will go back to each of these cemeteries for maintenance and upkeep.